Bulk sms sender is the best answer to all the problems related to SMS marketing campaign. This innovative software for bulk sms can send messages both in bulk and personalized ways to as many people as you want. You can either select whole list of numbers or can select a group to fulfill your purpose. It has multiple choices rigged that make the work adventurous for the users. 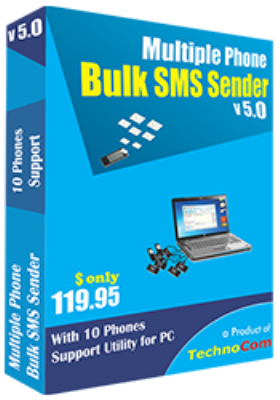 This Bulk sms sender tool works by just connecting your phone to your PC. It automatically recognizes the cell phone and starts working. Users have the freedom to connect 10 cell phones in one go. You can either dump numbers one by one or file with numbers saved in it. It's time saving to arrange list of numbers prior. The content you have used can be used for further planning or sending message to a new client. The USP of this tool is its ability to present reports on the messages delivered successfully and failed ones. The report gives user a clear picture of his reach in the market by giving the exact status of the messages he/she has sent. Starting from connecting to till sending of messages the bulk sms sender software does everything required. You can send sms from pc to mobile within minutes and can accomplish your target. This tool is undeniably the best software for bulk sms. No DND( Do not disturb) Restriction. Supports Multi Lingual SMS so that you can send SMS in Hindi, Gujarati, Urdu, Punjabi, Bengali, Tamil, Telugu, Kannada, Malayalam, German, French, Italian, Japanese, Arabic.